CostFact calculates the project’s life cycle cost in terms of the actual cash value and annuities, and enables comparisons of alternatives. 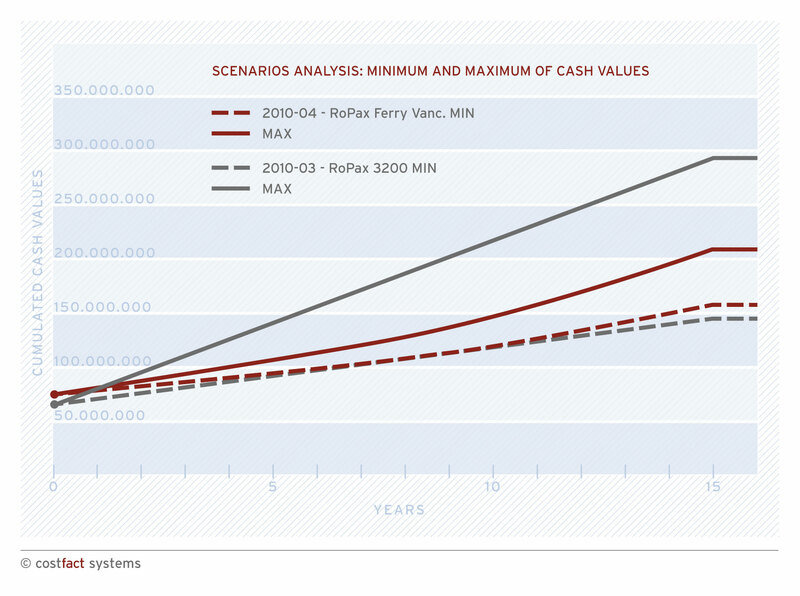 These analyses are not only useful for the ship’s operator, but for the manufacturer as well, such as when the shipbuilder can demonstrate to the buyer that the choice of a technical alternative can lead to a higher purchase price, but simultaneously to savings during operation that exceed the initial additional costs. Analysis of the in-service costs to identify the main cost drivers and to get indications of the cost causing technical parameters. Identification of the optimum service life of a project and the point in time where project profitability changes may take place. Comparison of projects and project alternatives. Display of the results in diagrams to easily contrast different projects. The uncertainty that inevitably accompanies the prognoses of Life Cycle Costing is incorporated by risk analyses and sensitivity analyses. CostFact calculates best and worst case scenarios based on payment-specific estimation errors. A sensitivity analysis is used to calculate the critical value of an input parameter that would cause a change in the advantageousness of two comparable technical solutions such as “what increase in the expected price of fuel will cause a profitability change in two different projects?”.